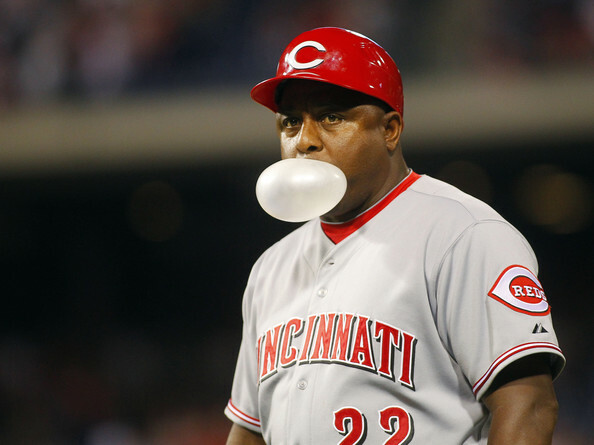 Billy Hatcher has become somewhat of a position coach legend in Cincinnati over the years. From fans adorning their shirts with his caricature, to him constantly garnering praise by the local media, everyone seems to love Ã¢â‚¬Å“HatchÃ¢â‚¬Â. The love fest with Billy Hatcher is well deserved. This is his 13th year in the Reds organization. He spent ten years as first base coach and just recently, in 2016, made a switch to coach third base. When he isnÃ¢â‚¬â„¢t winding his arm around like a windmill, sending base runners from third to home, he is joking with fans in the crowd and throwing balls to little kids. Billy Hatcher seems like a great human and a guy you want to have in the clubhouse. Looking past that, though, I wanted to evaluate Billy Hatcher and the work heÃ¢â‚¬â„¢s done at third base. Just from an eye test perspective, it seems like the Reds have base runners thrown out at third or home pretty frequently. Now, I will admit, evaluating this is pretty hard. IÃ¢â‚¬â„¢m going strictly off of OOB3 (outs on base at third) and OOBHm (outs on base at home). These stats count how many times a player has been thrown out at third base or home on a base running play. These stats do not include caught stealing, pickoffs, or force outs (things that wouldn’t really involve Hatcher, anyway). The caveat with these stats is that there are a lot of unknown variables. For example, how many times did Billy Hatcher tell a runner to stop at third base and the runner ignored him and went home anyway? Or, how many times did a player tag at second and try to take third at their own discretion? This applies to all teams really, so keep that in mind. In two out of the three years since Billy Hatcher has taken over as third base coach the Reds have been below league average in runners being thrown out at third and were 2nd in 2016. This does include 2018 data which isnÃ¢â‚¬â„¢t complete yet. These numbers are worse. 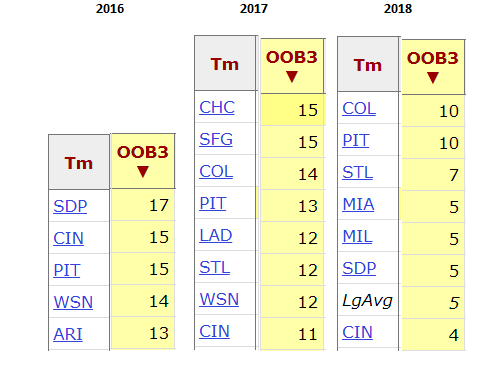 The Reds were 3rd in the NL in OOBHm in 2016, 4th in 2017, and 5th in 2018. That is pretty consistent. HatcherÃ¢â‚¬â„¢s OOB3 is worse in his first two years as third base coach than SmithÃ¢â‚¬â„¢s in the final year before he was fired. HatcherÃ¢â‚¬â„¢s OOBHm average of about 20 in 2016 and 2017 doesnÃ¢â‚¬â„¢t come quite close to SmithÃ¢â‚¬â„¢s historically bad 28, though. So, what does all of this mean? It means that the Reds have been near the top of the NL in getting runners thrown out at home or third base the past three seasons. Who’s fault is that? I’m not sure we can make a conclusion on exactly who’s fault that is. It could be a number of things but the third base coach must be held somewhat responsible. IÃ¢â‚¬â„¢m not calling for Billy HatcherÃ¢â‚¬â„¢s head, but I think there is some room for improvement. Whether it’s working with Hatcher in the off-season, reviewing tape and seriously evaluating him, or moving him back to first base and finding an upgrade at third base coach. There are options that the Reds could take to improve their base running situation. A runner being thrown out at third base or home during a game may seem pretty minute in the grand scheme of things, but those add up over the course of a season. The Mets had a league best 12 OOBHm last year and the Reds had a 20 OOBHm. When it comes down to it, in a contending year those 8 runs could be the difference between a win and a loss and ultimately a division title and missing out on the playoffs. Yes, but aggressiveness on bases might lead to runners scoring rather than being stranded. With 2 outs, the chances that next batter will knock them in is probably around 30% in that scenario, I think a 50/50 chance it is appropriate to send runner. And this flies against baseball advanced metrics, but: close plays at home are absolutely the best thing about baseball. Win or lose, I want to be entertained. I say, Send Them Billy! I will admit, the entertainment factor was not taken into account when I wrote this post. Good article Jeff, other than runners taking a base on their own, what if the first base coach tells him go three. When I did a little coaching I always told the runner on first don’t watch the ball watch the third base coach. There are way too many unknown variables to draw any conclusions. How about looking at the ratio of runs scored vs runners thrown out? There are a lot of unknown variables, but its pretty interesting that the Reds have been consistently near the top of the league in runners being thrown out at third and home since Hatcher has taken over as third base coach. Yeah, but Hatcher generally knows that a cruddy hitter is on deck, and so he may as well take a 40% shot. The Red Sox, by contrast, can be more conservative. It is inherently a small sample size. But you are right that it seems like they get nailed at the plate a lot. 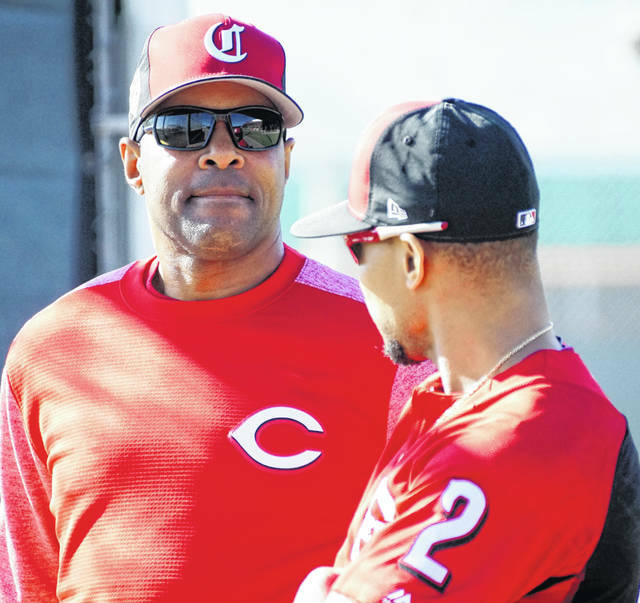 Maybe Hatcher just can’t make himself believe that Votto, Winker, etc. are such plodding runners. It is a completely different animal judging what to signal to Hamilton, as opposed to Votto. OK. if your name isn’t billy Hamilton or Jose Peraza and you are a red then you are very, very,……sloooow. billy hatcher’s 1990 reds team stole 160 bases. this team is on pace to steal about 40. I am sure that Hatcher sends players home knowing they will get thrown out but 10 feet hoping to send a message to management that guess what, we need faster players. I think the bigger concern has been some of the situations where he has sent runners. When you are down 4 runs with less than 2 outs, there is no reason to send a guy to kill a rally. That has happened a few times this year. The bigger issue is game awareness in Hatcher’s case. Having someone thrown out at home is not necessarily indicative in and of itself of poor coaching, even if the coach sent him. Need to dig much deeper. We have the Cubs to thank for TOOTBLAN, and their 3rd base coach – Wavin’ Wendell. Something that could be done is compare times thrown out to total base runners per team, or try to normalize the results to a metric based on total runs scored. If BP had not made a TOOTBLAN at 3rd in the first inning of game 3, the Reds would have swept the Giants in playoffs rather than lose in five. Yep. Painful to recall. Making unnecessary outs matters. Hatcher sends the runner only 59% of the time, compared to 70% league-wide. So compared to an average team, they are losing one run in every TEN of these opportunities. Not because Hatcher is running them into outs, but because they are stuck at third base. The next worst team is the New York Mets, who score a relatively healthy 60.2% of the time. If anything, Hatcher is not sending the runners enough. It’s not quite that bad, as some of those runners ultimately end up scoring anyway. But I’d say they are losing at least a couple wins per season compared to a team with average speed.